THE AUSTRALIAN BESTSELLER! Based on the true experiences of military dogs, here is a story of loyalty, strength, and the bond between a man and his dog that has captivated readers in Australia and the US. At the kennels, Caesar doesn't look special. But Corporal Ben Fulton sees something different—an intelligent dog whose curiosity will make him an excellent sniffer dog in the Australian Army. On operations in Afghanistan with Ben, Caesar proves his worth, finding hidden explosives and saving the lives of the soldiers. Then, during a Taliban ambush, Caesar is separated from his master. In the aftermath, Ben and his best friend Charlie are seriously wounded and evacuated to the hospital before being shipped back to Australia. But where is Caesar? From their home in Australia, Ben and his family search for clues that might reveal whether their beloved dog is still alive and surviving Afghanistan's bitter winter cold and capture by the Taliban. It will be a long road home, and Caesar will face many hardships along the way, but for this brave and loyal dog, anything is possible. This book is based on the true story of Australian military dog Sarbi and its experiences in Afghanistan, combined with the factual experiences of Endal, the devoted British dog who cared for his wheelchair-bound ex-serviceman master and became the most decorated dog in history. The success of this is first book led to a series of four more exciting Caesar the War Dog operations from Stephen's pen. Read all about them on this site. Both boys and girls have fallen in love with Caesar, with teachers and parents thanking Stephen. "These books have got my boys reading!' they tell him. 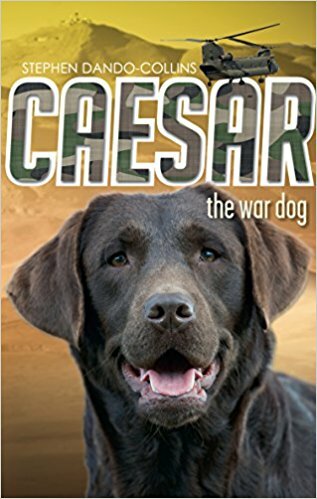 At a number of schools around Australia, classes have been reading the Caesar the War Dog series then writing their own fabulous 'Further Adventures of Caesar the War Dog.' Then, they've sent their work to Stephen, with each member of the class also writing Stephen a letter with their personal questions for the author. Stephen always sends a detailed thank you and reply to readers' questions. Stephen Dando-Collins, C/- Penguin Random House Australia, Level 3, 100 Pacific Highway, NORTH SUDNEY, NSW 2060. Pengiun Random House also have free Teachers' Resources available on this series.